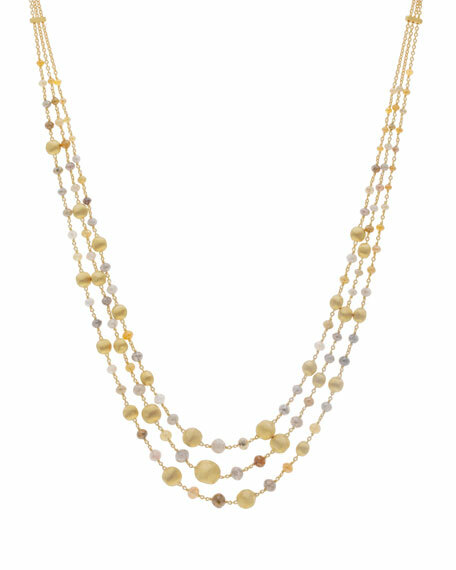 Marco Bicego necklace from the Unico Collection. Hand-engraved 18-karat yellow gold hardware. Multi-strand rolo chains with mixed stations. Raw uncut diamonds with round gold beads. 47.71 total diamond carat weight. "Unico," translated into English, means unique; these one-of-a-kind precious gemstone creations are as unique and individual as the lucky lady they adorn. The Unico Collection is continuously enriched with new jewelry, once again highlighting Marco Bicego's passion for organic forms and gemstones. Every jewel tells a story of travel, technical research, and attention to the most minute details. The beauty of the precious stones, unique in cut, shape, and color is enhanced by the 18-karat yellow and white gold settings, which are masterfully crafted by hand.